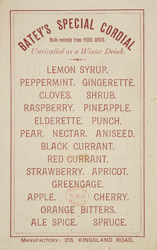 This leaflet is advertising Batey’s Cordials and fruit syrups. As can be seen from the leaflet the cordials were sold either in bottles or glasses and came in a variety of flavours from peppermint and raspberry to more unfamiliar essences like shrub and spruce. These cordials were ‘Unrivalled as a winter drink’.